When on your ship during battle, that ship may use total WEAPONS against X different targets, where X=number of Borg aboard. This personnel’s skill allows its ship to fire WEAPONS against multiple targets during a battle, if a current objective or other card (e.g., Gowron of Borg) allows targeting of multiple ships, or if returning fire or counter-attacking. 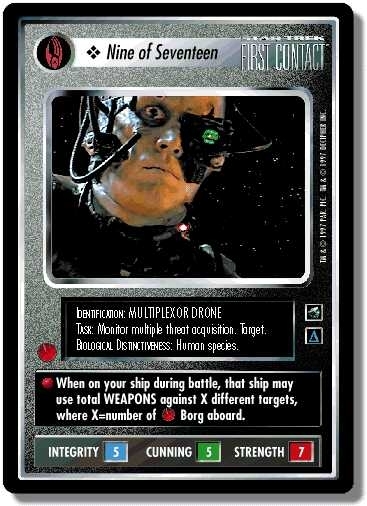 For example, if your opponent attacked any of your forces on the previous turn, and he has two ships and an outpost at the location of that attack, your Borg Cube with a Multiplexor Drone and two other Borg aboard may attack both ships and the outpost with 24 WEAPONS against each of the three targets. See battle - ship - multiple targets. There are 24 entries for Nine of Seventeen (ST1E 4 C 83) at the Tradeplace (79 haves and 1 wants). Click here to see all trade list entries for this Common card!